I am always on the lookout for meals that are easy and quick and that the whole family can enjoy. My latest find is the rotisserie chicken. I know they’ve been around forever, but I never actually stopped to buy until recently and now I am hooked! I usually buy one rotisserie chicken a week and use it as a base for different meals. I slice it up and eat it hot out of the oven, chopped over salad or pasta or rolled up in a whole wheat tortilla with low-fat cheese and veggies. It always tastes great, the whole family loves it and it’s all precooked and ready to serve so there’s no prep work for me! Plus at about $7.50 per chicken, it’s an affordable meal that easily feeds my whole family of five and sometimes even leaves me with leftovers. Three ounces of skinless, white meat chicken (about the size of a deck of cards), provides 105 calories, 21 grams of protein and 1 gram of saturated fat. Compare that to three ounces of beef which contains roughly 165 – 225 calories and 2 – 4 grams of saturated fat, depending on cut. So if you’re looking for an easy, inexpensive and tasty way to add chicken to your diet, stop by your grocer’s deli counter and check out the rotisserie chickens! This is one of my favorite quick-and-easy methods for meals! I also buy a rotisserie chicken about once a week and do a variety of things with it, from cold chicken salads to putting it in pasta dishes and sandwiches. definitely a WONDERFUL thing…………and so many markets sell them fresh now as well. Hot and ready to go. SO many things you can do with it thus very versatile. Just last week I found a recipe on one of my go-to recipe sites that used a rotisserie chicken for homemade chicken stock for a wonderful and fairly quick chicken noodle soup. It still took about two hours, but it was worth it for the homemade taste! After pulling all the meat off the bones, don’t waste them! Boil the bones to make an awesome chicken broth for your freezer. I do that all the time and it saves me $$ at the supermarket – not to mention it’s much easier to skim the fat off when its cold! The broth can be used in so many low cal soups! I buy a rotisserie chicken about every three months for myself. During the fall to end of year holidays, it’s sometimes up to 4 because of family get-togethers. Everyone likes the seasoned chicken, so it becomes part of the meal. Because of the extra food, no one has to cook for at least a day afterwards. Costco’s are around $5.00 each and either say gluten-free or wheat free. The label was changed to wheat-free because there are restrictions on using gluten-free. I read the ingredients even if they do say gluten-free. My husband picks up a rotisserie chicken a couple time a month.. They are really good for a busy day when you don’t have time to cook something yourself a couple extras and dinner is served! plus he loves them.. he got us a rotisserie oven that I use pretty often, but it’s extra nice to have one already prepared every once in a while. I use them in an enchilada casserole also . You pull the chicken off the bones put in a fry pan and add your favorite taco or enchilada seasoning mix and a jar of tomato salsa . layer chicken covered with tortillia shells , sour cream, refried beans and cheese. Repeat and cover with cheese. Baked until warm and the cheese is melted . This is an easy quick meal that is very good. It also warms well if you assemble it the night before. 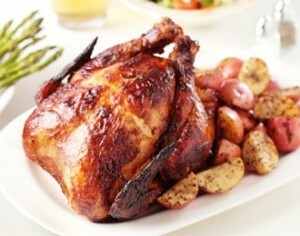 I too recently tried the rotisserie chicken…………and oh my goodness……I fell in love. I couldn’t believe the wonderful aroma that wafted from the bag when it was opened. I used to it make a wonderful new recipe which was a hit. YEAH to the chicken! !